Absolutely no one asks me what kind of makeup I wear, mostly because I hardly ever post photos of myself. But I do in fact have a face, and enjoy makeup. I'm working on taking more photos of myself. I realize that is important in blogland, having actual photos of yourself without sunglasses on your blog so that people can put a face to your name, I just usually prefer to be on the other end of the camera. 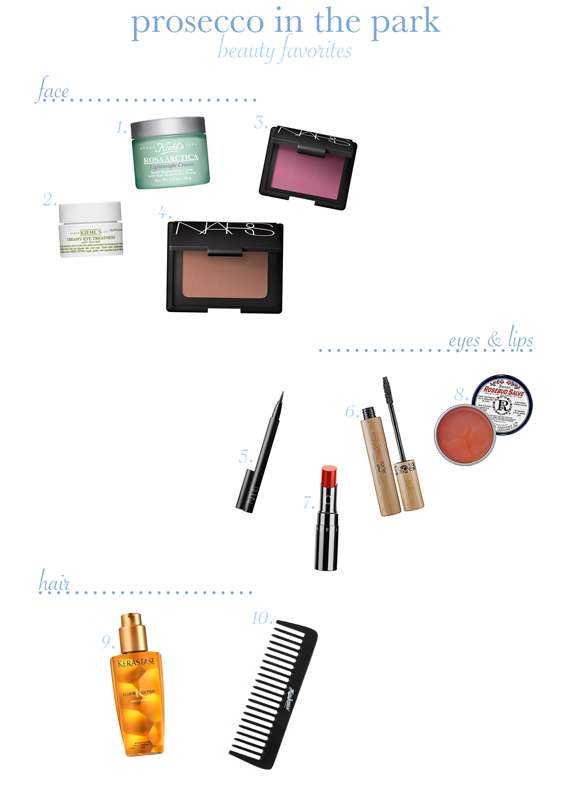 Anyway, here are some of my current favorite beauty products. 3. NARS blush in "mata hari"
4. NARS bronzer in "laguna"
I have been using these two moisturizers from Kiehl's for over a year and love them. The face cream is light enough to use year round but really does an excellent job at prevent my skin from drying out in the cold. And the eye cream is just wonderful at brightening and eliminating puffiness. Lately I have been obsessed with NARS blush in "mata hari". It looks really bright in the compact but is much more subtle on. It's one of those colors that you can build on if you like a more dramatic look. The "laguna" bronzer has been a year round staple in my makeup bag for what feels like forever. What I love most about it is that it suits my skin tone with a bit of a tan in the summer and when I match the snow in the winter. 5. NARS eyeliner in "carpates"
7. Chantecaille Lip Chic in "geranium"
Again with NARS, I really love their products. I'm horrible at applying liquid eyeliner but love the look. This pen makes it so easy to apply and control the thickness. It's a dream. This Tarte mascara has been my go to since I first discovered it years ago. It doesn't dry out my lashes and never flakes. I just love Chantecaille's Lip Chic. It smells so wonderful and keeps lips moisturized. Rosebud Salve has been a lifesaver. I primarily use it on my lips but it's great on cuticles as well. Since making the decision to keep my hair long, I have made a conscious effort to take the best care of it possible. I now understand why Kèrastase's Elixir Ultime is referred to as "liquid gold". It has made my hair so much more manageable and less frizzy, even on humid or rainy days. It is expensive, but does last a long time and if you have them, you can use your birch box points to save a few dollars, which is what I try to do. A wide tooth comb (any one will do) has been equally as helpful for me in preventing breakage and hair loss in the wet hair detangling process. I don't know how, but my hair manages to get massive, seemingly indestructible knots and I was getting frustrated with my hair breaking off as I tried to sort it out. Carefully using a wide tooth comb has made a world of difference. And that's it! What are your favorite beauty products? Nice post! That blush does look really bright in the pan! Such a good review, I will def try some of these!